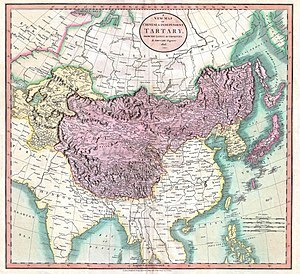 Map of independent Tartary (in yellow) and Chinese Tartary (in violet), in 1806. Tartary (Latin: Tartaria) or Great Tartary (Latin: Tartaria Magna), was a historical region located in northern and central Asia stretching eastwards from the Caspian Sea and from the Ural Mountains to the Pacific Ocean, inhabited mostly by Turkic peoples. The vast region spanned much of the Pontic-Caspian steppe, Volga-Urals, the Caucasus, Siberia, Central Asia, Mongolia, and Manchuria. Tartary was often divided into sections with prefixes denoting the name of the ruling power or the geographical location. Thus, western Siberia was Muscovite or Russian Tartary, Xinjiang and Mongolia were Chinese or Cathay Tartary, western Central Asia (later Russian Central Asia) was known as Central Tartary, and Manchuria was East Tartary. As the Russian Empire expanded eastward and more of Tartary became known to Europeans, the term fell into disuse. There was an ethnic and cultural exchange between Slavic and Turkic tribes in Russian Tartary and Muscovite Rus'. European areas north of the Black Sea inhabited by Tataric peoples were known as Little Tartary. The "Komul Desert of the Tartary" was mentioned by Immanuel Kant in his Observations on the Feeling of the Beautiful and Sublime, as a "great far-reaching solitude". East Tartary and Maritime Tartary are old names for the Manchu-inhabited territory extending from the confluence of the River Amur with the River Ussuri to Sakhalin Island. This area is now the Primorsky Krai with Vladivostok as regional administrative center. These lands were once occupied by the Mohe tribes and Jurchen nation; and also by various old kingdoms including Goryeo, Balhae, Liao and the Khitan kingdoms. According to Sheng-Wu-Chi's Ming dynasty chronicle ("Our dynasty is informed by military realizations"), in this land the Tungus Weji, Warka and Kurka tribes were established. Later these were unified in Manchu Qing Empire with Nurhaci as their leader and founder. These lands were lost to Russia under the Treaty of Peking. Nearest this land lies the Ku-Ye-Dao (Chinese: 庫頁島; pinyin: Kùyèdǎo) or Fu-Sang (Hangul: 후상) island, better known as Karafuto or Sakhalin; in recent times Russian archaeologists have found here remains of ancient cities with walls and castles. These may correspond with the ancient Manchu nation, or possibly during Mongol or Tungus times, or the Balhae kingdom. These lands were visited by Japanese explorers, Mamiya Rinzo and others, who reported on the various important cities and ports, such as Haishenwei (present day Vladivostok). From these lands and nearby Hulun (Amur area), the Japanese have claimed North Asian ancestors, who settled North Japan. Other ancient cities in the region are: Tetyukhe (now Dalnegorsk) and probably Deleng, an important commercial imperial post according to some records. In the novel Ada by Vladimir Nabokov, Tartary is the name of a large country on the fictional planet of Antiterra. Russia is Tartary's approximate geographic counterpart on Terra, Antiterra's twin world apparently identical to "our" Earth, but doubly fictional in the context of the novel. In Puccini's last opera, Turandot, Calaf's father Timur is the deposed King of the Tartars. In Philip Pullman's His Dark Materials novels, the European main characters often express fear of Tartars, a term apparently referring to many Asian races, as the story takes place far from Mongolia. In Macbeth, by William Shakespeare, the witches include Tartars' lips in their potion. Also, in Shakespeare's Midsummer Night's Dream, the character Puck makes an allusion to the swiftness of Tartars' arrows. In Mary Shelley's Frankenstein, Dr. Frankenstein pursues the monster "amidst the wilds of Tartary and Russia, although he still evaded me, I have ever followed in his track". In "The Pied Piper of Hamelin" by Robert Browning, the Pied Piper mentions Tartary as one of his credentials in pest removal to the Mayor of Hamelin. "In Tartary I freed the Cham, last June, from his huge swarms of gnats". In his short work with E. Hoffmann Price, "Through the Gates of the Silver Key", H. P. Lovecraft briefly mentions Tartary: "Upon their cloaked heads there now seemed to rest tall, uncertainly coloured mitres, strangely suggestive of those on certain nameless figures chiselled by a forgotten sculptor along the living cliffs of a high, forbidden mountain in Tartary". "The Squire's Tale" from Geoffrey Chaucer's Canterbury Tales is set in the royal court of Tartary. In Jonathan Swift's Gulliver's Travels, the eponymous hero refers to his travels in Tartary on two occasions, and suggests that the then modern geographers of Europe were "in a great error, by supposing nothing but sea between Japan and California; for it was ever my opinion, that there must be a balance of earth to counterpoise the great continent of Tartary". L. Frank Baum's origin story of Santa Claus, The Life and Adventures of Santa Claus, features mythical antagonists from Tartary who oppose Santa's compassionate gift giving practices. They are described as the Three-Eyed Giants of Tartary. In Matthew Arnold's poem "Sohrab and Rustum", the poem begins with "And the first grey of morning fill'd the east, And the fog rose out of the Oxus stream. But all the Tartar camp along the stream Was hush'd, and still the men were plunged in sleep." In Walter de la Mare's poem "If I were lord of Tartary", Tartary is an imaginary land full of happiness. In Washington Irving's short story "Rip Van Winkle", the title character would "sit on a wet rock, with a rod as long and heavy as a Tartar's lance". Gioachino Rossini included a piano piece in his Péchés de vieillesse titled Boléro tartare. Wikimedia Commons has media related to Maps of Tartary.